There is an array of great sedans in today’s market, but the 2017 Toyota Corolla is truly in a class of its own. It’s efficient, well-equipped, and one of the most dependable sedans you can buy. However, we know that you and drivers in Avon, Indianapolis, and Plainfield need a bit more information about this impressive sedan before you can decide if it really is the perfect car for you. 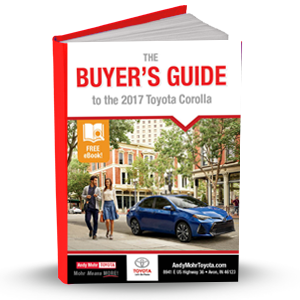 That’s why Andy Mohr Toyota has created this free Buyer’s Guide to the 2017 Toyota Corolla.